Saildocs is easier if they have the file you care about, but they do not include all zones. For either method, you need to know the zone name of the region you want. 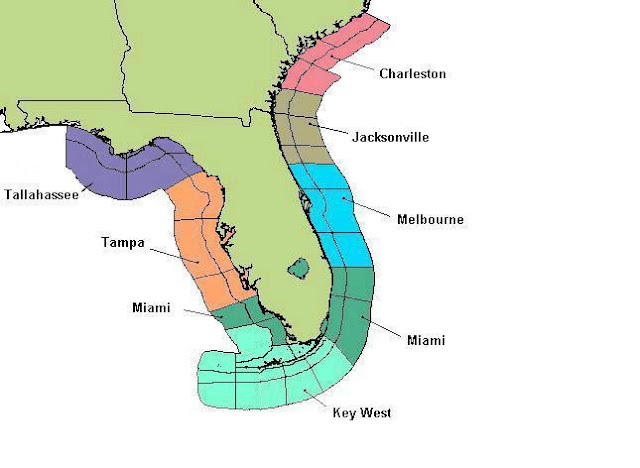 Below is a sample of the forecast zones around the south tip of Florida. Fig.3 Coastal zones, in detail. These are copies of the defining pictures online, which are difficult to read.... we really do miss the Marine Weather Services Charts that showed all these clearly. Coastal waters just off Miami is in zone AMZ651. Note that even though the zones are given in the NOAA images in uppercase, all file names we ask for must be in all lower case. The high seas zones are discussed in an earlier post. These are each conveniently obtained from saildocs as noted there. If you can identify a zone by local name, then there is a list of lists of the zone names online below, with links to the data. For convenience, we have our own list the file names at the end of this note. This list can be searched and we are in the process of organizing it by region. 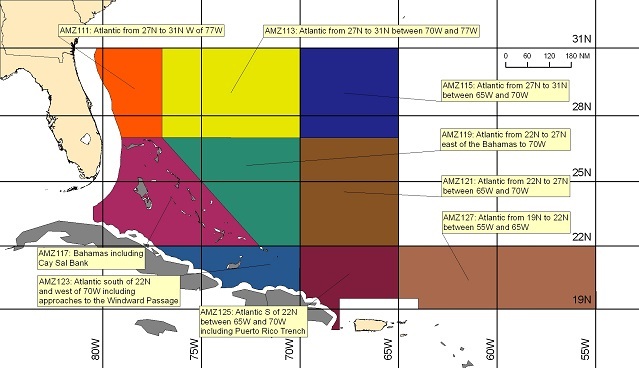 Marine text forecasts subdivided by zone for the U.S. East Coast (Western Atlantic) and Caribbean including Puerto Rico and the U.S. Virgin Islands. Marine text forecasts subdivided by zone for the U.S. West Coast (Eastern Pacific). Marine text forecasts subdivided by zone for the Gulf of Mexico. Marine text forecasts subdivided by zone for the Great Lakes and connecting rivers. Marine text forecasts subdivided by zone for Alaska. Marine text forecasts subdivided by zone for Pacific Islands. Checking the list of filenames at the end of this note, we see that most have the form xxz###.txt, such as for Miami amz654.txt.
" send amz654" to query@saildocs.com. The answer is they have this one. You can try it here. The subject line does not matter, but you might copy there what you are asking for to help fine the request for resubmitting. Method (2). Using the official NOAA FTPmail is more hands-on. We reach the right root folder by sending an email to nws.ftpMail.ops@noaa.gov, then we open the root and change to the right directory, which is different for different types (see above), and then we ask for one or more files. Each statement on a separate line, all capitalization matters. It is best as plain text mail with nothing else in the mail, and definitely nothing above these lines. Here is a sample. You can also practice this one here. FTPmail and saildocs work the same for simultaneous requests. You can ask for more than one product, but they will each return as separate emails. There is no directory structure issues with saildocs, you can ask for offshore and coastal at the same time. with FTPmail you must switch to a new directory for differnt types of data, so it is just as easy to send new mails as to negotiate the remote directory changes in one mail. A couple operational differences with saildocs: If you send a wrong query to saildocs, they will tell you it was not recognized. FTPmail will not. You just don't hear back. Also it tends to take a bit longer. The main reference for the FTPmail system is a long interactive appendix in the back of an unrelated reference manual, which has changed content over the years, but retains the same filename rfax.pdf. Our list of the forecast files is below. We are slowly organizing this and cleaning it up. Note that the forecast discussions are in different subdirectories as are other special products as well. This is an important service to know and master. There is some crucial data available with it, especially related to tropical storm forecasting, that is not available from other sources. In practice, if we find something we want, we first check to see if saildocs has it, and if so, use it, else we rely on this primary government service. In more than one place NOAA states that any of their text or graphic products is available by FTPmail. Later we show how to get latest observations. We have earlier notes on how to get graphic weather maps by FTPmail and saildocs. For completeness, there is a Method (3) if you are online. Namely look up the file name you want, and then just put that into a search engine, and you will get the latest report directly on the screen. Note that the filenames in whole hundreds, such as amz500,txt or amz600.txt will be synopses of the weather, not actual forecasts. I am not sure what the first part of the filename means, but the kmfl and kkey terms identify airports. Here is a list of all metars. The cwf stands for coastal weather forecast followed by last 3 letters of the airport id. Download the KMFL forecast and you see that it is called “Coastal forecast for south Florida,” and it is just the combination of AMZ600 (the synopsis), AMZ650 + AMZ670 (0-20 nmi+ 20-60nmi), AMZ651 + AMZ671, AMZ630, GMZ656+657 (wrapping around into the Gulf), GMZ676, and AMZ610 (Lake Oceechobee). not available. This is not true! We have a detailed glossary of this type in our Weather Trainer software. supplementary information at times for coastal areas. intervals and other unscheduled times as system approaches landfall. 1500z and 2100z during hurricane season, May 15 - November 30. 1500z and 2100z during hurricane season, June 1 - November 30. 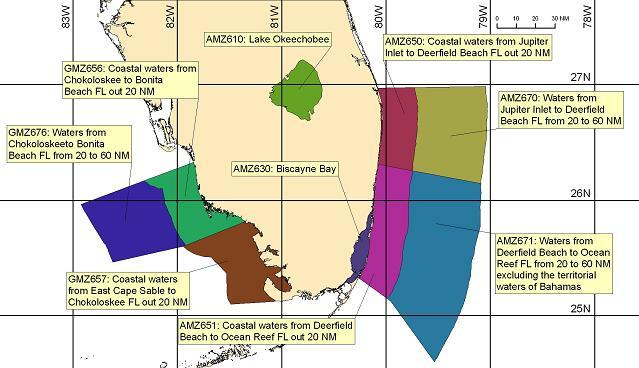 COASTAL and NEARSHORE MARINE FORECASTS (explain which zones are included) fz = forecast zones?? AMZ710 Atlantic Waters of Puerto Rico and U.S. VI from 10 NM to 19.5 N.